Sleeping, pooping, and eating seem to be the bane of every mother’s existence. If our children are not sleeping properly, we tend to feel like bad mothers for not be able to help settle our babes into a restful slumber. If our children are not pooping, we fret and worry that there is some hidden health issue lurking. But if our children are refusing to eat what we painstakingly prepare for them, well, that just drives us up a wall! At first we will worry about the overall effect of a decreased or nonexistent appetite but eventually we go into “operation get our toddler to eat mode” and the battle begins. This is not good for mommy or toddler. Food and meal times should never be a war zone. As the mother of a 22 month old daughter who has always had an extremely small appetite along with a host of physical eating challenges (i.e. strong gag reflex, texture issues, delayed ability to properly chew and swallow) I have struggled with strategies to get her to eat a variety of foods that keep her nourished, healthy and full of the energy she needs to simply be a toddler. I have done a lot of research, talked to my friends, read books, and quite frankly have not come up with a “fix-it” solution (although I have seen improvement in eating habits here and there). Having said that, I will share with you what I have learned and perhaps you can benefit from one or more of my suggestions. Please keep in mind that if you are practicing extended breastfeeding, your toddler’s appetite will fluctuate based on how often he/she is partaking in mama’s milk! I leave the tray out during morning snack time and afternoon snack time and let my daughter choose what she wants. Usually, after a few days she has sampled one of everything. Keep the portions extremely small and add some hummus or dip to the tray if that entices your toddler to try different foods. Create kid friendly works of art with the food! I will arrange dinner so it looks like a smiley face. My daughter will usually eat a few bites when the food is “funny.” I also make food into sushi style rolls. I can practically add anything into a tortilla, roll it up and slice it to look like little pieces of sushi. Some days it is a big hit. Other days, it hits the floor! Keep serving sizes small. Be sure that you are offering three or four small portions of different items at each meal. I have found personally (and from researching and talking to others) that a tablespoon portion is all you should offer. If your child eats it, add more. Large portions are overwhelming! Offer healthy (homemade if possible) dips. Toddlers LOVE to dip and spread so let them have at it! Make healthy, nutritionally balanced smoothies. 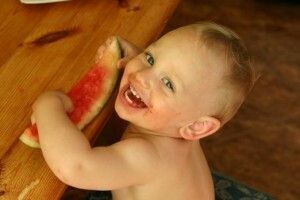 Sometimes toddlers will drink their fruits and veggies as opposed to eating them. This is fine. If it gets in them, who cares how! If your children like the smoothies, keep offering them. My basic smoothie recipe is raw milk (you can use almond milk, coconut milk, kefir, yogurt, etc. ), pureed pumpkin, frozen berries, something green (i.e. frozen spinach, broccoli, peas), almond butter, a splash of vanilla and sometimes a banana. You can add ice to change the consistency and can basically use the ingredients in any proportion that makes it taste “yummy.” Feel free to experiment with flavor combinations. This one seems to be a continuous hit with my daughter and it is nutritionally complete. She will usually drink 6 ounces a day. Have a color or shape “theme” meal. Cut everything into squares or serve circular items. Make everything the same color. The color concept takes a little planning but it can be interesting and enticing to your toddler. Make up a song or a rhyme about the theme to engage your child. Let your children help prepare the food. My daughter always loves to eat whatever she has had the chance to help make. She knows that “she” made it. Avoid sugary foods and processed foods. As the saying goes “the body wants what the body craves” and refined sugars and carbohydrates set up cravings for these foods. I personally don’t give my daughter any cereal because even the “wholesome” cereals aren’t that nutritional. Cereal tends to be the go-to item for a lot of frustrated mothers. It is filling and again, not that great nutritionally, so just be conscious of how much you are offering. Keep meal times consistent. Children, especially toddlers, are creatures of routine and habit and inconsistent meal times can actually disrupt their eating habits. Keep meal times calm. Keep the mood light, conversation casual, and just focus on being together as a family. Save debates and heavy conversation for child free time. Don’t make a big fuss over your children’s eating. Try not to “praise” your child when he/she takes a bite of something he/she has been avoiding. Don’t try to force your child, bribe your child, etc. into eating. Do not use food as a reward or punishment.1 Doing any of the above mentioned things can set up eating issues and an unhealthy relationship with food for the life of your child. Keep offering. According to just about every expert out there, it can take 6-8 weeks of offering the same food before your child will develop a taste or distaste for it. So keep offering the foods your family typically eats. Don’t give up after the first few tries. Children WILL eat when they are truly hungry. Unlike adults, they have a harder time expressing hunger and fullness. Seriously – all the experts agree that children will eat when they are hungry. I have yet to meet a picky eater who was starving to death. Watch all-day snacking. With the exception of the nibble tray at snack time, children should not be encouraged to wander around and eat. Even though your child might not eat a lot at meal time, he or she will probably eat even less if she is constantly snacking throughout the day. Keep meal times free of distractions. If your toddler is sensitive to background noise, turn off the television and music. If you have a pet that your child likes to “share” with, put the pet outside or in another room. Serve the family meal, plus one “toddler-approved” food. I serve my daughter what we are eating along with one item that I know she likes at that moment. I will usually add her “like” food item after she has either eaten a little of the other food or after she has totally ignored the other food. Remember that your child is NOT being manipulative at this age. He/she is far too young to possess this sort of thought process. He/she is simply exercising his/her preferences at that exact moment. One technique I tried (that worked) was replacing my daughter’s favorite crackers with crackers that I knew she would not like. When she asked for a cracker instead of eating her dinner, I gave her the substitute cracker. She eyeballed it, licked it, and threw it on the ground. She did this for two days and then stopped asking for the crackers. She then started eating a couple of bites of dinner. This lasted a week or two and then she was obsessed with only drinking “tea.” Food preferences do tend to come in cycles from my experience. If you have two or more toddlers in your family, do not worry about the fact that one may be picky and the other is not. They are two different children and what one does the other may or may not do. Yes, monkey see, monkey do; however, both of your children have a mind of their own and chances are, they will continue on with their own patterns and preferences with brief interludes of copying each other. Jennifer is one of Natural Parents Network’s mentors on our “Ask the NP Mentor” panel. This post actually stemmed from an “Ask the NP Mentor” question, and Jennifer’s response was so complete that we turned it into a post! Jennifer is a former government recruiter turned stay-at-home mama to a precious daughter (Aaliyah) brought earthside in March 2009. She is passionate about breastfeeding (especially extended breastfeeding), co-sleeping, attachment parenting, cloth diapering, green living, babywearing, peaceful parenting, a Waldorf approach to education and parenting, playful parenting, getting children outside, as well as cooking and eating Traditional Foods. Thank you so much for this post! I struggle with an eating disorder, so I am always worried about how to approach food and meal times with my son. These resources will really help us as he grows into toddlerhood. thank you for such an informativre post. my hubs was v. concerned about our son not eating much and admittedly i was to but this came right on time! Great post! I pretty much agree with EVERYTHING here, too! We have struggled with picky eating, especially with my oldest, but no severe issues, thankfully. I have learned to (mostly) chill out and not worry too much about it, but it’s HARD! I really believe that I have a responsibility to set the foundation by offering a variety healthy foods, at regular times, and leaving what/how much she eats up to each child. I really avoid trying to cater to their preferences or making “special” meals for them, as that seems to spiral out of control so easily. What is nice about having three kids is usually at least one of them will like some part of the meal, which makes me feel better for some reason! Great post! My little guy has been turning his nose up at some of his favorite foods lately. It’s good to know that he’s just being a toddler! One food that he constantly asks for is pizza. Since I make ours from scratch, I can put all kinds of toppings on it, making it very nutritious AND something that he’ll eat. So, right now, I’m making pizza four times a week and feeding him leftovers on the off-days. I guess I’m lucky he’s not asking for cookies!